Welcome to Jobscan. In this video, we’re taking a top to bottom look at the resume Match Report. 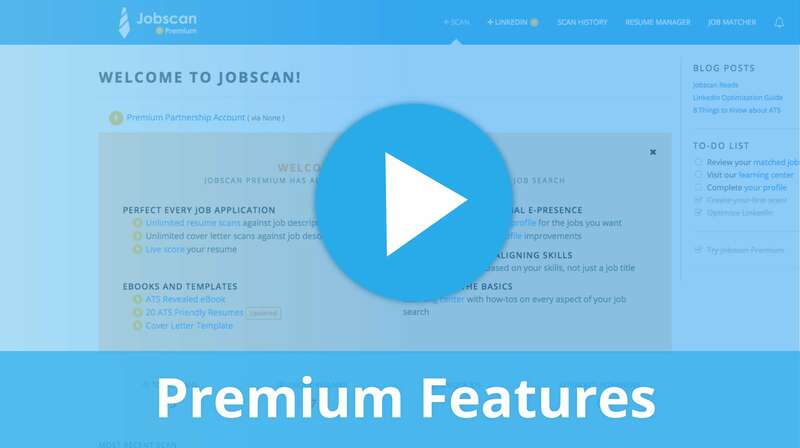 If you’ve never scanned a resume with Jobscan before, be sure to check out our introductory video first. This is the Jobscan resume match report. The match rate percentage is calculated by comparing the job titles, hard and soft skills, education levels, and other information on your resume to the job description. Jobscan recommends scoring an 80% match or higher before applying. This increases your chances of beating the filters inside applicant tracking systems, otherwise known as ATS. The first round of checks includes important ATS findings based on Jobscan’s research, such as job title matches and the right college degree. Jobscan’s scoring algorithm accounts for common behaviors found across top ATS. That said, every system has its own quirks. With ATS Tip, you can gain additional insights based on the specific ATS a company is using. Jobscan has also interviewed and surveyed recruiters from various industries to include Recruiter Findings. These tips are based on what the human eyes want to see, and include checks for measurable results, buzzwords to avoid, industry knowledge, and more. The Hard Skills section is where you should spend the majority of your time. These keywords correspond directly with essential job duties and tend to serve as important search terms for recruiters. Focus on skills that appear most frequently in the job description, adding them to your resume in the same tense or word-form. Click on any skill to see the context in which it’s used in the job description. If an irrelevant skill pops up, click the X next to the keyword to remove it from the report, then click “Refresh Scan” to see an updated score without using up one of your free scans. Prioritize hard skills over the soft skills and other keywords found below as they are more likely to be used by recruiters as search terms. After you’ve made some adjustments to your resume, click “Update Resume & Rescan” on the left sidebar to perform a new scan and see how much your score has improved. At the bottom of the report, check out additional job openings based on the top matching skills from your resume, as long as job matches are available in your area. Get your own resume match report at Jobscan.co.